Competitors make a turn in the eighth annual KAPRB Kids Cross Country run at Anson B. Nixon Park. 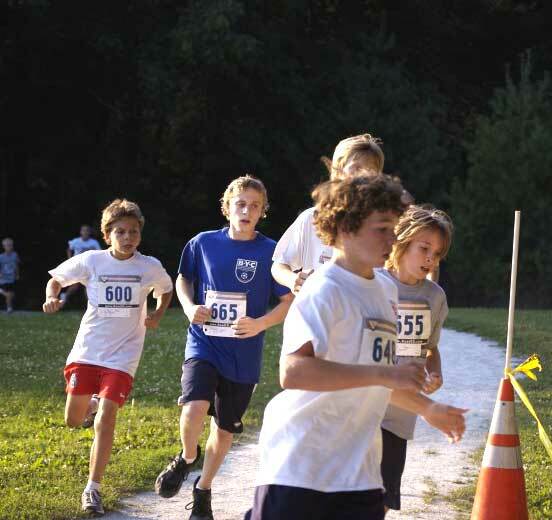 KENNETT — The eighth annual KAPRB Kids Cross Country run was held last Thursday night under perfect conditions. At race time at 7 p.m. it was cloudy and 77 degrees at Anson B. Nixon park. The race lead by race director Claire Finfrock and a crew of volunteers was successful for the eighth year in a row with a great turnout of 14 year old and younger runners. Finfrock said she was very happy with the evening at Anson B. Nixon in Kennett. “We had 112 runners finish and I was very happy with how everyone had a really good time. “It could not have happened without the many people in the community who came out to act as course marshals and help with registration and the finish line. A special thank you to the KAPRB board who were out in force to volunteer,” she added. Stetson Fenster Age 12 ran a 8:58.02 for the 1.5 mile course holding off last year’s winner Alex Wilkins by 4 seconds. Wilkins is headed for the eighthgrade at Patton Middle School and will be running cross country in the fall. Fenster is a successful runner and soccer player. With the way he ran last Thursday I don’t see him getting very tired while playing soccer. He looked sharp out there. His form was fluid and his pace quick and effortless by observers on the sideline. In first place for the girls is another eighth grade student, Kacie Breeding from Patton Middle School. She was third overall and ran a speedy time of 9:11.60. Kacie plays a great amount of soccer, basketball and lacrosse for URA and some other travel teams. With her base of great work ethic and raw natural running speed I expect her name to be mentioned quite often here in the future. Olivia Young placed second for the girls in 9:18 and is a 9th grader at Unionville in the fall. Olivia is in the midst of training very hard for cross country at UHS and should be a major contributor for the Indians. The last finisher was Brendan Mannion, Age 4 with a 20:27.15. He was tiny with golden curls and came running into the finish with a large smile on his face. Running for children is natural and joyful and Brendan was a perfect example. Along with Anson B. Nixon employee Mark in the Park as he is called, and Mark Piacentino the trails were in awesome condition. Piacentino and his volunteers over the years have been instrumental in refining the trails in the park. Recently Piacentino built a storm water drain where there were constant issues under the Walnut Road trail. There has not been any erosion at this trail since the work has s been completed by Piacentino and his volunteers. Finfrock was very appreciative of all of the volunteers and participants but she wanted to relay a special than you to all of the sponsors of the 1.5 mile race. Brusters donated delicious water ice; Walgreens provided water and took photos of all of the runners. The Kennett Run Charities provided sponsorship, along with Cari Orthodontics, and Dr. Ganly an optometrist in Kennett Square. Next up for the Kennett Racing circuit is the 3rd Annual Mushroom Festival to be held on September 11. Download the 2011 Mushroom Run Walk registration form here.